It's another sunday morning ride. 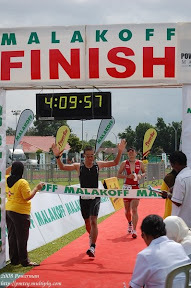 This time its 40.55km in a time of 1:46:36 hours. The route was from Sg Akar - Jalan Kebangsaan - BSB - Jalan Kianggeh - Kota Batu - Mentiri - Sg Akar. There were around 8 hills including 2 long mid-rise hills (1 - 1.5km). It was a challenging ride for six of us. Next ride will be on Tuesday at Sg Akar Criterium. This time we are planning to do 3 loops. From above, it seems that I'm doing more cycling and rest compared to running. Only 16 km run for this week. Buruk, buruk..............so starting tomorrow........I'm aiming to get 30 km overall run.